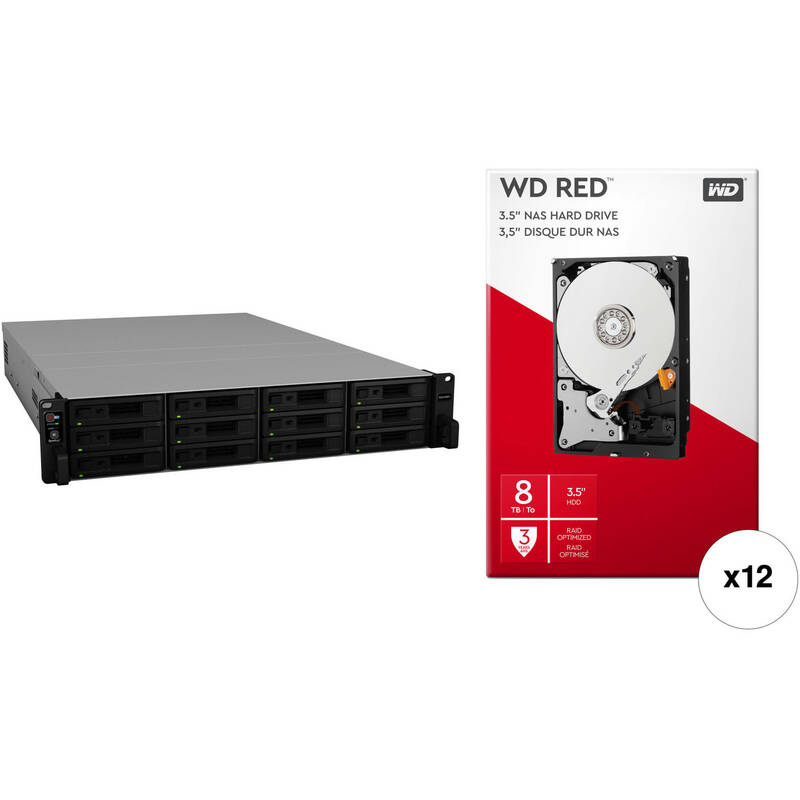 This B&H Kit combines the Synology RackStation RS2418RP+ 12-Bay NAS Enclosure with twelve WD 8TB Red 5400 rpm SATA III 3.5" Internal NAS HDDs for a total storage capacity of 96TB. Replacing their RS2416RP+, the RS2418RP+ RackStation 12-Bay NAS Enclosure from Synology is a scalable NAS designed for growing businesses. It provides up to 144TB of storage space, as each of its 12 drive bays supports drives up to 12TB, and it can be expanded to 24 drives using the RX1217(RP) expansion unit. Driven by a 2.1 GHz Intel Atom C3538 Quad-Core processor, the RS2418RP+ delivers sequential read speeds of up to 1400 MB/s and iSCSI 4K random writes of 27,000 IOPS. It comes configured with 4GB of 2133 MHz non-ECC and unbuffered memory, which can be expanded to 64GB using ECC unbuffered modules. Network connectivity is achieved using four Gigabit LAN ports, while an optional NIC can be installed within the PCIe 3.0 slot. Also featured are dual redundant power supplies and protection is provided by a limited 3-year warranty.